I’ve just finished watching ESPN’s fabulous O.J. : Made in America, a five-part documentary about the Hall of Fame football player. Somewhere in the process of digesting this latest — and, perhaps, best — telling of O.J.’s story, I scoured Wikipedia for details about his life. I discovered that the page has been edited more than 4,000 times since it went up in 2003, back when Wikipedia user “Vera Cruz” posted the first biographical snippet. Since then, users have slowly edited — and vandalized — the current bio’s 5,000 words, a process I’ve charted below. I recently added some new charting tools here thanks to NPR’s excellent daily graphics rig, which we used recently to compare air quality in Seoul with other large cities. There’s still plenty of tinkering to be done here with the rig, especially with deployment to WordPress. But as a first public test, I made several tile grid maps to show Electoral College results in presidential elections since 1980. The “maps” use a tessellated grid of hexagons, rather than actual geographic shapes, to show Republican red and Democratic blue. 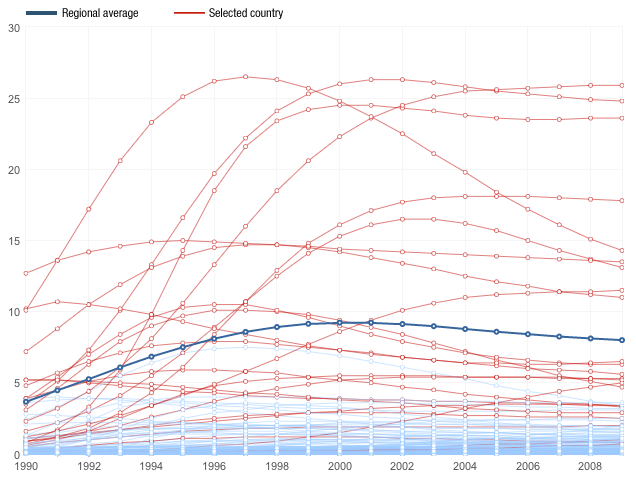 This week Washington is hosting the International AIDS Conference, and one of my colleagues crafted this interactive to show how HIV infection rates differ by country and region. See a larger interactive version of the map, which was created with Development Seed’s TileMill application and hosted on its MapBox service.